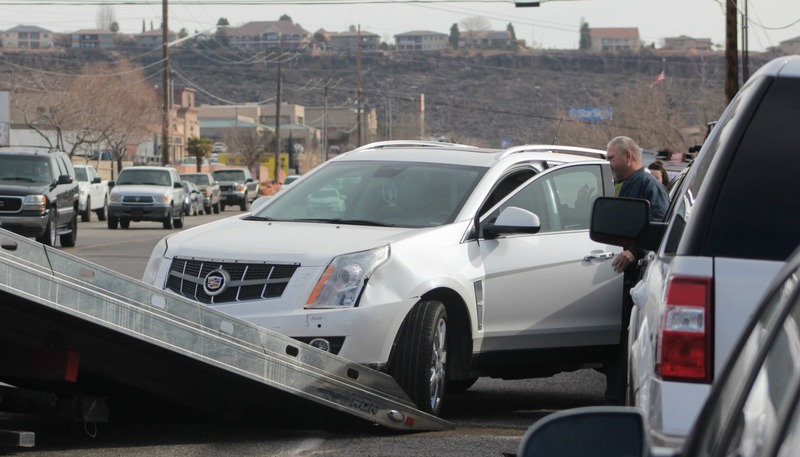 ST. GEORGE — Four vehicles were struck and two of them towed Wednesday after a collision was set in motion when a driver blew through a stop sign on 800 East. At about 11 a.m. officers were dispatched to the crash involving a blue Hyundai that was heading north on 800 East and a white Cadillac SUV heading east on Tabernacle, St. George Police officer Andy Michelson said. The Hyundai ran the stop sign at the corner of 800 East and Tabernacle and was struck by the Cadillac as it continued through the intersection, which spun both vehicles around and sent the Cadillac back toward the curb where it crashed into a red Subaru and a black Dodge Journey parked along the street. Both vehicles were towed from the scene, while the two parked vehicles were damaged but remained operational. No injuries were reported. The collision blocked the eastbound lane of Tabernacle for nearly an hour while traffic was diverted away from the crash as emergency personnel tended to the scene.